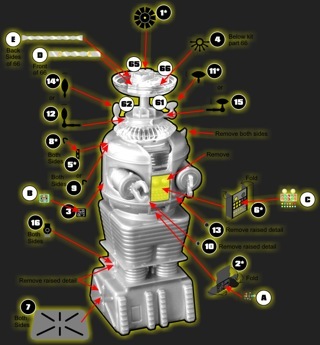 Bring the Robot™ to life with this feature packed photoetch and decal set. Suitable for lighting*, the photoetch pieces provide crisp, in-scale details that can't be matched in plastic, while the included decals (from JT Graphics, of course!) make painting the small details a breeze. We've even included special metalic inks to help bring the "brain" alive! For Moebius Models kit 418, or the Robot included with their Chariot, kit 902. NOTE: This is for the 1/24 scale Robot kit, NOT the 1/6 scale kit. If you have the larger kit, please CLICK HERE.